To begin investigating the panel degradation issue, it’s important to know exactly what the terms “degradation” and/or “Power or Performance Warranties” mean. These industry terms will be used by installers and salespeople when presenting their photovoltaic systems for your consideration. Degradation is the term used to describe how the efficiency of a panel will deteriorate over a period due to the effects of weather, UV light exposure, ageing and pollution, etc. PV manufacturers will give customers a 25-year power or performance warranty covering this rate of degradation. If it’s “linear” that means the degradation will be stated to be no more than a set amount per year. Typically between 0.4% and 0.9% per year. However, it doesn’t mean your solar panels will degrade at that level. That’s merely the warranty amount. As an example, when you get a warranty for your new boiler, you don’t expect your boiler to break down within that timeframe. But the warranty is there as a guarantee in case it does. The same goes for PV solar panels (photovoltaic). Neither you or for that matter, your installation company, should expect your panels to degrade by more than the amount stated. But the warranty is there in the unlikely event it does. Now most good PV installation companies, when projecting forward the performance of a system over some years, will input an annual degradation rate of 1%. They will take the yearly kilowatts generated in year one, e.g. 3500 kilowatts and reduce that by 1% each year to 2730 in the last year of the feed-in tariff (FIT). They then factor in inflation rates for the FIT and possible energy prices rise in the cost of electricity to give a potential payback time in years and likely earnings and savings you should expect. That’s pretty much standard practice for all ethical installation companies. However, a comprehensive study by the National Renewable Energy Laboratories clearly shows this might not be the case. They pulled together over 40 years of published literature, covering nearly 2000 degradation rates. Their results are interesting. They found the “1% per year rule” was far too pessimistic for panels produced before 1999. With that said, today’s solar panels are manufactured with better techniques and rare earth elements, lasted far longer than their earlier predecessors. The most commonly installed pv solar panels in the UK are monocrystalline that has an annual degradation rate as little as 0.5 percent per installed before 1999 and as low as 0.4 percent for systems produced after that pivotal year. 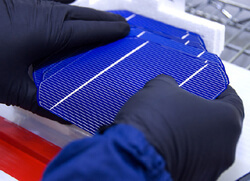 These figures mean photovoltaic panels manufactured today can efficiently produce 92% of its original performance rate after twenty years of service. This rate is very much higher than the 80 percent estimated by the “1% rule” that is commonly bandied around by salesmen today. Photovoltaic arrays installed in more heated climates, such as equatorial regions show much quicker degradation rates, compared to systems installed in our more temperate climate – probably due to their higher level of UV exposure. On the other extreme, such as icy climates, photovoltaic panels that endure heavy wind and snow suffered the most. However, solar panels in our more moderate climate, had degradation rates as low as 0.2 percent per year, so on this basis, you can assume that your panels could retain 96 percent of their its original pre-installation performance rate after twenty years. Degradation rates are currently used to calculate the return on investment and although good practice should be encouraged amongst solar salespeople within the industry, the standards commonly used today. This sales pattern is understating your ‘return on investment’, rather than overstating – overstating the degradation rate should be viewed as a good thing. During industry testing and analysis, we always assume the worst and hope for the best. I would like to thank Norman from our forum for this information. Most ethical salespeople or installers use such degradation figures, so you won’t think your solar panels need replacing the average 25-year performance warranty ends. And, they won’t, and proven that PV solar panels installed to some of the earliest satellite technologies are still working fine today. Even in the high UV environment of low Earth orbit, the photovoltaic panels that integrate into that early technology are still producing power to enable enthusiasts to make contact with retired 36-year-old satellites today. This viewpoint is for me the proof of the pudding. My early enthusiasm for all things solar technology was sparked by the building of the international space station (ISS), in the full knowledge that if this technology could power a sub-orbit science laboratory, then they could easily power my home. But the real heroes in our thirst for knowledge comes from the Mars rovers Spirit and Opportunity. After ten years, the solar panels have been subject to ultra-high doses of UV radiation because of Mars’s lack of a magnetic shield. Enduring the sandblasting from Martian winds and seasonal extremes, These brave technological pioneers should be the only endorsement that solar panel technology needs.